Google Pixel Buds, while a good-sounding set of Bluetooth earbuds, are sorely lacking in gestures that let you do more without yanking your phone out. A few months after its launch, Google is now in the process of issuing a sizeable update that aims to fix that. Moving onto the main attraction, a double tap gesture now skips tracks. While this should have definitely been available day-and-date with this product’s release, we’re happy to see it arrive. 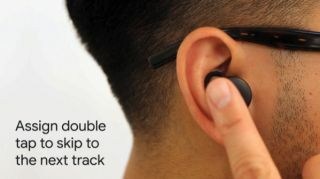 The lack of track skipping was one of the Pixel Buds’ more questionable omissions compared to the Apple AirPods.